Whether you’re a lover of lakeside scenes or an admirer of timeless vintage touches, Madelyn and Chad’s Tennessee wedding is sure to inspire. The two took creative cues from some of their closest friends, incorporating one-of-a-kind invitations and custom dress designs by none other than Madelyn’s dearest pals. Their wedding drew its subtle autumn color palette from its surroundings, incorporating simple, romantic nods to the season and letting nature shine. 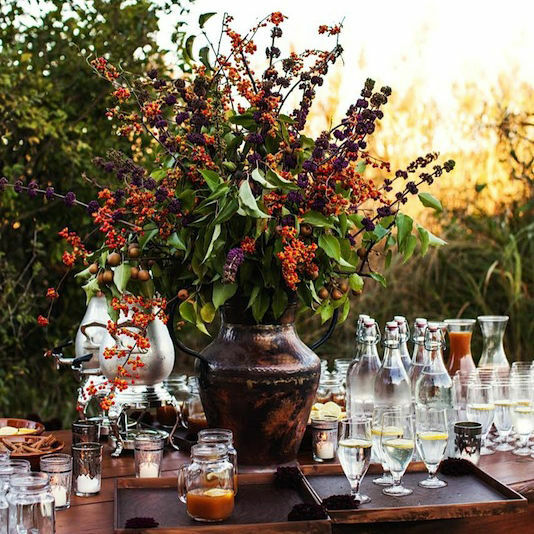 And, boy, did their autumn Tennessee wedding make the most of this lush landscape. Scroll on to soak in all the views and vintage details in these stunning images from JoPhoto. With Joe & Kathleen of JoPhoto at the center of their love story, Madelyn and Chad asked if they might make it official at the photographers’ lakeside home in Knoxville. It’s easy to see why. More than your average lake house, the property’s glowing fall foliage, rolling hills, and sweeping waterfront views offered the perfect backdrop for their Big Day. No flipping through stacks of stationary books needed here. 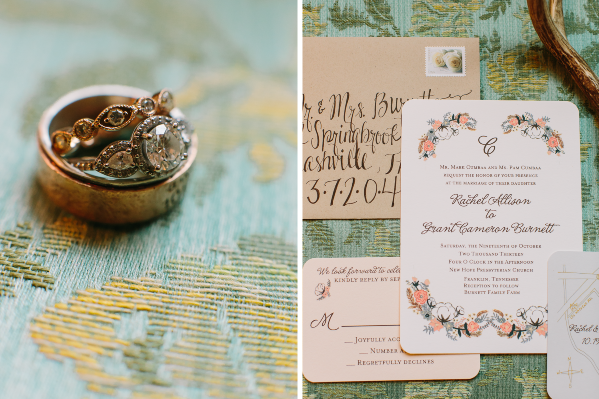 The bride’s one-of-a-kind invitation suite was designed by her talented maid of honor. Madelyn’s new lifelong accessories showcase her timeless and feminine style, with ornate, vintage-style elements on both rings. 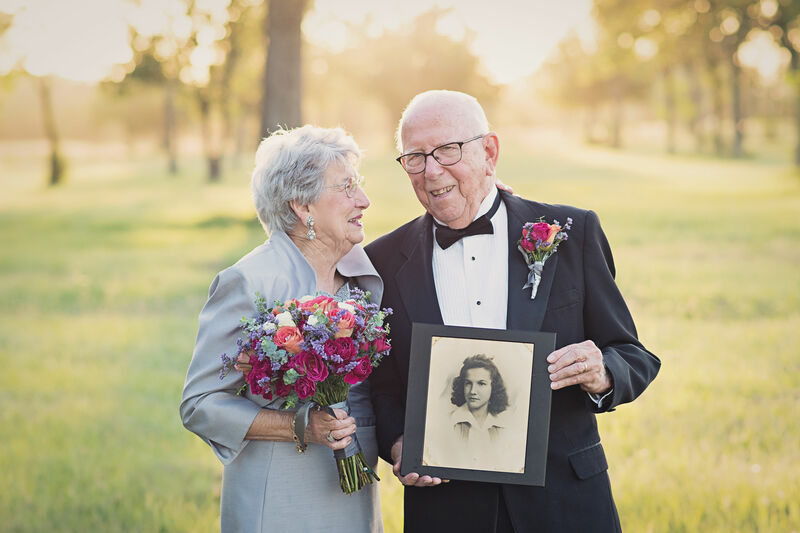 From the very start, Madelyn’s day was accessorized with little vintage details. Another wedding original, Madelyn’s dream dress was a custom collaboration with a close friend. Its sheath silhouette with subtle drama created a bridal look full of vintage glamour. An elegantly draped open back and perfectly placed beads brought an antique air to Madelyn’s ensemble. Well-blended touches of color placed on a neutral backdrop seamlessly paired this bridal bouquet with its surrounding views. Now that’s a group of genuine supporting ladies. This awestruck ensemble of grey- and blue-hued bridesmaids beamed with pride as Madelyn revealed her bridal look. The groomsmen looked the part in classic suits, allowing the groom to subtly standout with a lone fall floral boutonniere. It’s easy to see that this little one is just as angelic as her twirl-worthy flower girl dress would suggest. The two said “I do” surrounded by friends, family, fall foliage, and waterfront views. Madelyn and Chad made the most of the lakeside grounds, celebrating with dinner and dancing in the autumn outdoors. Guests were greeted by reception tables draped in elegant metallic touches and floral elements that played homage to the natural setting. Guests capped the night off with the perfect lake house treat – a s’mores bar. After dancing the night away, Madelyn slipped off her sleeves and sealed the deal with a kiss in front of a sea of sparklers.